TOP: Bureau of Alcohol, Tobacco and Firearms agents approach the front door of the Branch Davidian compound near Waco on Feb. 28, 1993, in an attempt to serve a search warrant. Four agents and six Davidians were killed in the confrontation. ABOVE: Baylor University Truett Seminary students tour the grounds of the compound last week. Bureau of Alcohol, Tobacco and Firearms agents approach the front door of the Branch Davidian compound near Waco on Feb. 28, 1993, in an attempt to serve a search warrant. Four agents and six Davidians were killed in the confrontation 20 years ago. Aerial of the Branch Davidian compound taken just two months before ATF agents raided it. Four agents and six Davidians were killed in the shootout 20 years ago. 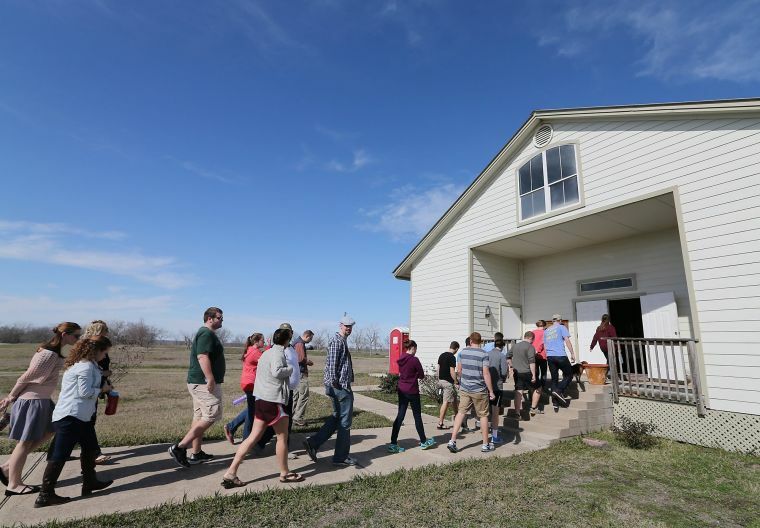 Baylor Truett Seminary students tour the grounds of the Branch Davidian compound on Feb. 19. The 20th anniversary of the beginning of the siege is Thursday. Clive Doyle, a survivor of the 1993 siege, now leads informal church services at his Waco home with other Davidians. Baylor seminary students tour the remains of the Branch Davidian compound near Elk. Charles Pace, who claims leadership of the present-day Davidian movement, has taken control of the 77-acre compound site along with a chapel that was built years after the siege. Pace was not involved with the siege and was not a follower of Koresh. A granite marker welcomes guests to the remains of the Branch Davidian compound, site of the deadliest law enforcement confrontation in U.S. history 20 years ago. Artificial flowers lie at a base of a monument for those who died from the shootout and fire at the Branch Davidian compound. Markers for the fallen Davidians have been relocated near the entrance of the compound and mortared together. Baylor Truett Seminary students tour the grounds of the Branch Davidian compound earlier this month. In a 1989 photo, David Koresh, right, stands with his father-in-law Perry Jones, left, and his brother -in-law David Michael Jones, center. Behind them are houses that were torn down when Koresh’s followers built a sprawling new compound, which was later destroyed by fire. A passing motorcycle leaves the Branch Davidian compound earlier this month. Davidian survivors of the 1993 siege aren't planning to visit the site during their reunion in Waco this April. The Sixth Floor Museum, far left, overlooks Dealey Plaza in Dallas, the site of the Kennedy assassination. Dallas’ Sixth Floor Museum opened in 1989, 26 years after the JFK assassination. The museum tells the story of the tragedy. After a community is seared by unthinkable violence, the shock and grief usually give way to the impulse to carve the memory into stone. A memorial is a community’s attempt to punctuate tragedy, to close it with a period, or perhaps an exclamation point or a question mark. Public memorials have honored the victims and shaped the storyline of terrorist bombings in Oklahoma City and New York City, of a president assassinated in Dallas, and of mass shootings across the country, including in Killeen and Austin. But Thursday, on the 20th anniversary of its beginning, the Branch Davidian disaster east of Waco remains an unpunctuated sentence. On Feb. 28, 1993, federal agents raided the Branch Davidian sect’s compound east of Waco, setting off a confrontation that killed six Davidians and four Bureau of Alcohol, Tobacco and Firearms agents. A 51-day FBI siege followed, ending April 19 in an inferno that killed 76 Davidians, including 21 children. Twenty years later, no memorials or interpretive sites have been erected outside the site itself, which now is controlled by a small faction of Davidian followers and is avoided by survivors of the siege. On Thursday, officers with the Bureau of Alcohol, Tobacco and Firearms will hold private ceremonies to honor the fallen agents, but ATF officials declined to say where the ceremonies will be. The surviving Branch Davidians will meet the week of April 19 for their annual reunion, which usually draws about 50 people. But they will avoid Mount Carmel, the 77-acre site of the siege and blaze, because of an ongoing dispute about who represents the Branch Davidians. Meanwhile, the Tribune-Herald “Through Our Pages” museum and the long-dormant Helen Marie Taylor Museum of Waco History both have Branch Davidian exhibits and are planning to open for tours at some point this spring. “There are very serious questions that should not be left to popular culture images,” he said. Melton said he understands Waco’s reluctance to claim the Branch Davidian disaster as part of its identity. He noted that Waco became a household word overnight, associated both with religious extremism and heavy-handed federal law enforcement. The Branch Davidian disaster has been eclipsed by events such as the 9/11 terror attacks, he said, but it is too shocking to leave public consciousness. Waco Mayor Malcolm Duncan Jr. said he hasn’t given any thought to memorializing the 20th anniversary of the disaster and doesn’t want the city to take sides regarding who is to blame. But he said it should be recognized as part of Waco’s history. “Regardless of where the physical place is, the first place people think about when you mention the Branch Davidians is Waco,” he said. 12 miles from downtown Waco and eight miles beyond the city limits. The Davidians moved there in the 1960s from their communal headquarters near Lake Waco. Liz Taylor came in as Waco’s tourism chief in the middle of that public relations challenge, starting her job on March 1, 1993. She said she admired Sheehy for stepping up to represent Waco in front of the TV cameras. Taylor said she doesn’t think the popular association of Waco with the disaster has tarnished the city’s image, but she thinks a museum exhibit, not a monument, would be the best way to recognize that history. The events of spring 1993 have been thoroughly investigated in reports from the U.S. Treasury Department and special counsel John Danforth. But controversy lingers about who was more at fault and the nature of the Davidian sect. Melton said that after the Mount Carmel siege and the 1995 Oklahoma City bombing that was planned in revenge for it, officials became more interested in understanding the thinking of so-called extremist groups. For several years, FBI officials consulted with religion scholars about “new religious movements,” until 9/11 turned their attention toward Islamic radicalism, Melton said. The lingering controversy about the siege made Waco leaders reluctant to weigh in on its meaning, said Lawrence Johnson, a Waco attorney who was on the council during the Davidian episode. Soon after the ATF raid, he recalled, the council passed a resolution in sympathy for law enforcement officers who had died. But Johnson, who was a friend of a deceased Davidian member, wanted to go further. In June 1993, he persuaded the council to pass a resolution to recognize the loss of “innocent children” in the fire and express condolences to the families of all people who died in the tragedy. But there’s little precedent for how such an event could be memorialized. The Davidian tragedy was unique in the scale of deaths and the difficulty of sorting out blame. There was no problem in identifying who were the victims of 9/11 or the Oklahoma City bombing, or of various mass shootings. Memorials have been built or are in the works for all of the 10 deadliest mass shootings in the last half-century. In Texas, those include the University of Texas at Austin tower shooting in 1966 and the Killeen Luby’s shooting in 1991. The Killeen shooting at the time was the deadliest on record, with 24 dead including the shooter. Fred Latham, a Killeen city councilman of that era, said the city chose to put the memorial near its civic center rather than at the strip mall where it took place, at the wishes of both the restaurant and victims. He said memorial services on prominent anniversaries still draw crowds, and the memory of the tragedy still unites the community. But he doesn’t see a parallel with the Waco case, and he’s not sure a memorial is appropriate for the disaster here. The 1963 assassination of President John F. Kennedy also is a much different kind of tragedy than Waco’s, but the problems in commemorating it were similar. For years, Dallas’ reputation was shadowed by the killing, and some media outlets branded it the “city of hate” because of the anti-Kennedy sentiment there before the assassination. A large abstract cube representing an open tomb was erected in downtown Dallas in 1970 to honor the fallen president. But there was no interpretive site to guide the thousands of people who each year visited the memorial and nearby Dealey Plaza where JFK was shot. In the late 1980s, the Dallas County Historical Commission answered that need by renovating part of the former textbook depository building where Lee Harvey Oswald took aim at Kennedy. Lindalyn Adams, chair of the commission during the planning and opening of the Sixth Floor Museum, said many prominent Dallas residents opposed the effort as inappropriate. She said that in 1984, well into the planning process for the museum, tycoon Ross Perot, Cowboys coach Tom Landry and makeup entrepreneur Mary Kay Ash were panelists on a television show covering the Republican Convention. All agreed that the textbook building should be torn down. “That’s a natural feeling: Let’s put this behind us,” Adams said. Ash later became a major supporter of the Sixth Floor Museum, she noted. Today, visitors to Mount Carmel hoping to get a coherent story of the Branch Davidian episode are likely to be disappointed. On a recent Friday afternoon, the gates of the site were unlocked, but the property mostly was deserted, except for one tourist and a few loose dogs. Wild ducks swam on a weedy pond and a cold wind swept across the winter grass. The remains of the sprawling compound building have been removed, except for a swimming pool that was used as a bunker during the siege. The chapel and the property are under the control of Charles Pace, who considers himself a Davidian leader but is at odds with Doyle and other followers of Koresh. Pace has created a new memorial by mortaring together stones marked with the names of the Davidian dead, stones that originally were spread through a grove of crape myrtles. A hodgepodge of other granite memorials are scattered across the site, including one honoring the ATF officers and one donated by a militia group. But it appears that for now, they are memorials that ATF officers and siege survivors are unlikely to visit. And city tourism officials say that with each passing year, they get fewer inquiries seeking directions to the compound. Johnson, the former councilman, said he still would like to see more recognition of what happened at Mount Carmel in 1993. Their apocalypse came and went on a Monday afternoon, 20 years ago this week. More than a dozen organizations from around the county are coming together to promote the study and preservation of local history.